Snow and ice can cause serious damage to outdoor HVAC units. Having snow pile up on or around your unit or having a layer of ice on it can affect the way it runs. Your outdoor HVAC unit will need to work harder in order to heat your home, which places a lot more strain on its components. When this occurs, your HVAC unit might end up with a shortened life span and need to be replaced. Clear away snow: Clear snow off of the unit, and shovel it away from the sides and bottom, so that air flow won’t be restricted. Eliminate ice: Let ice thaw from your unit, and avoid using an ice pick or other tools to try and scrape it off, since this could cause damage. You can also use warm water to help it thaw. 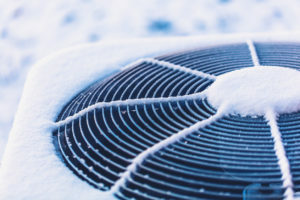 Keep in mind that outdoor HVAC units typically have a defrost cycle that helps clear away thin layers of frost and ice. Check your gutters: Make sure that your gutters are clear of debris, or melting snow could end up dripping onto your HVAC unit below. If you need help with winter weather protection for your HVAC unit, please contact Hartman Brothers. We offer high-quality HVAC services for homeowners in the New Haven area.